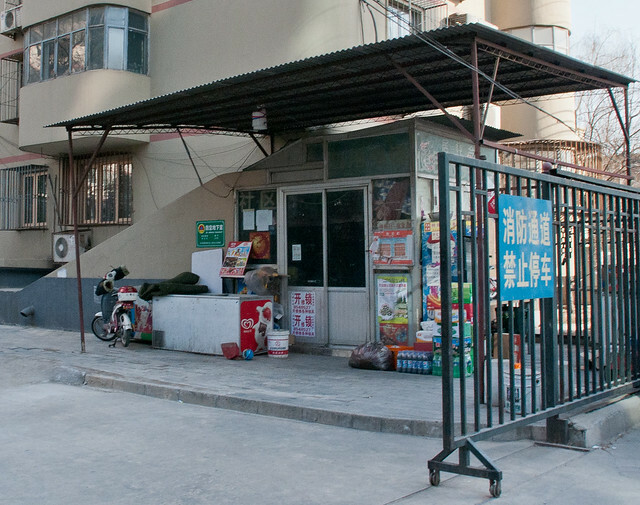 This is a convenience store that Shanshan and I frequent. It is across from our apartment complex. The store is in the entrance to air raid shelter. The shopkeeper, his wife, and their young son sleep on beds constructed on the staircase leading down into the shelter. Their son spends time in the shop, and at the fruit stand I wrote about earlier. I often take Leo by on our morning walks. If their son is around, he takes the leash from me and takes Leo on a short walk. Posted in Beijing Youjian on 2012-04-15 by sujinyan.